ecocirc® wireless Instant Hot Water System | Aqua-Tech Sales and Marketing Inc. 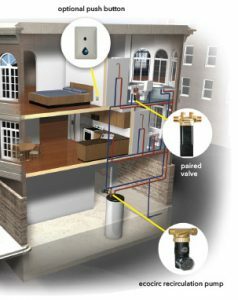 Designed for plumbing systems without a recirculation line, the ecocirc wireless uses unique ECM (Electronically Commutated Motor) technology to achieve significant energy savings while operating on as little as 20 watts of power. A paired valve is installed under the sink, or other water outlet, farthest away from the water heater, where hot water takes the longest to arrive. 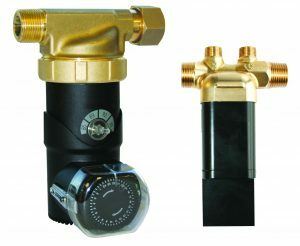 The valve is battery operated and equipped with an onboard temperature sensor and wireless RF transceiver and communicates with the circulator pump mounted to the water heater or hot water source.